Post your favorite canoe race experiences whether you paddled the Kenduskeag or were a spectator/vulture earlier today. Who knows - some of these stories might actually be true! 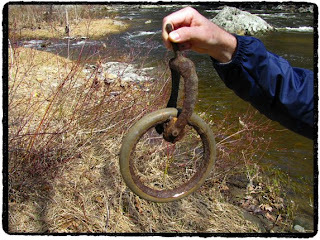 This is the place to post your lost & found items after the Kenduskeag. Paddlers should be as clear in their descriptions as possible (and hopefully you labeled your boats and paddles before the race). Thanks in advance to all of the thoughtful people who find lost items along the stream and mention them here for their owners to retrieve. 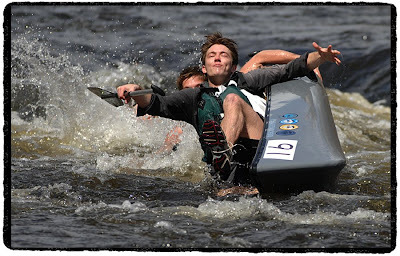 The Kenduskeag looks good and should be a lot of fun this year for a broad spectrum of paddlers. Here are some of my impressions and I hope you will add yours here as well. Keep in mind that stream conditions will change between today and Saturday morning. For one thing, the stream should be a bit lower than it is as of this writing. The photo above shows what the area of rapids variously known as "Shopping Cart", "Washing Machine", "Thunder Hole" (and a few other names) looked like on Tuesday. Enlarge the photo for a better view. Compared to last year and certainly the year before, this area isn't quite as scary looking, but that should not be taken to mean that the stream won't provide any thrills or challenges this year. Far from it! Let's start closer to Bangor and work our way upstream to Six Mile Falls, because that's how I roll on these walking tours. The area known locally as the Shopping Cart isn't nearly as hairy as it was last year, and nothing at all like it was in 2007. That's not a bad thing, as these rapids tend to surprise a lot of people who think that the worst is behind them. Chances are, you'll be pretty much spent by the time you reach the Shopping Cart rapids, so I wouldn't want to give you the impression that you can just sail on through without difficulty. 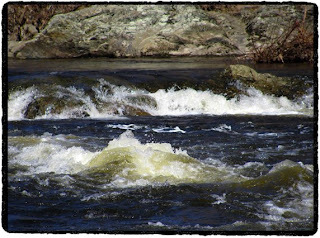 Here's a closer view of the "tongue" of the rapids. Note the standing waves, which do tend to throw people for a loop. You have to be alert, and I'm thinking that river right is going to be the line most people will take when they approach this area. The shelf on river left (see photo) was somewhat passable on Tuesday but will likely be too shallow on race day, certainly for many canoes. They don't call it the Shopping Cart Hole for nothing! 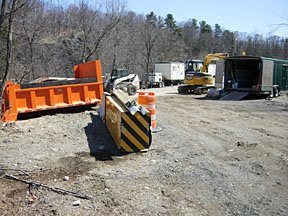 Which reminds me, I'm pretty sure there is a Kenduskeag cleanup event scheduled soon (perhaps the day after the race) by Keep Bangor Beautiful, and the cleanup relies on the efforts of volunteers. For more information call 990-1201 or email Keep Bangor Beautiful. Or just do what we did and pick up the junk as you come across it. OK, moving on. 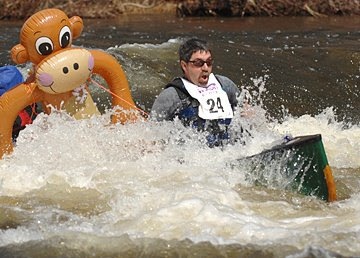 Let's take a quick look at the two mandatory portages on the Kenduskeag Stream Canoe Race. Maxfield Mill Dam, and (further upstream) the Flour Mill Dam. Chris D'Amico, who scouted the stream with me on this walkabout, pointed out an interesting thing with regard to the "mellow" waters and the mandatory portage at Maxfield. There's a nice little rocky "beach" available for landing. This is usually submerged under a few feet of water. Also, the calm "coves" on river right can be used as a rest stop for paddlers who need to take a breather or bail their boats. Nice! Now we move on upstream to the Flour Mill Dam. This is also a mandatory portage and if you didn't portage at Six Mile Falls (which is optional), this is the first portage you're going to hit. 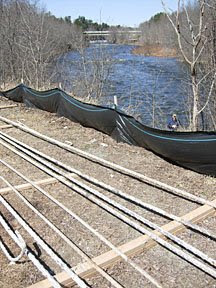 The remains of the Flour Mill Dam are just upstream from the I-95 bridge. 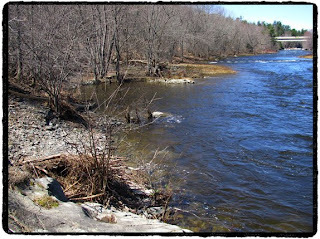 There's a nice walkway and lookout over these rapids if you are walking along on the Kenduskeag pathway. Note the calm conditions here at this portage. Again, it's a nice thing to have a "mellow cove" for paddlers because these portages can become congested. The grassy area is often submerged under a few feet of water. The take out at the Flour Mill Dam is river left. Here's a map of this area. It's a good thing the Flour Mill Dam area is a mandatory portage. This area is otherwise quite scary. You won't have to worry about the toothy rocks as seen in this photo because you'll avoid it altogether. As you can see, these "molars" would chew your boat up and spit you out. 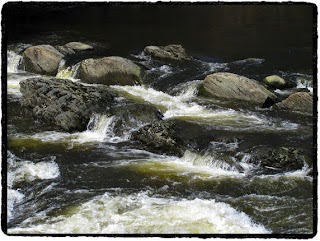 And these rocks are just upstream from some nasty rapids. It wouldn't be pretty. Just as an aside: I had to include this shot of the large pipe which runs through the remains of the Flour Mill Dam. This was taken from the Flour Mill overlook. 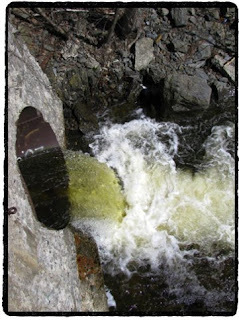 In the earliest years of the Kenduskeag race (circa 1966, 1967) it was possible for paddlers to portage the Flour Mill Dam by sluicing their boat through this large pipe! Don't try to do this now, however. Note the spillway and the drop. 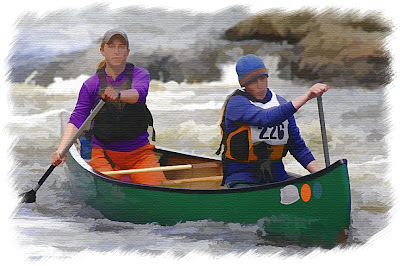 Bill and Fern Stearns wrote about this rather unusual portage option in their book "Tales of the Kenduskeag", at a time when only a couple of dozen paddlers braved the stream for the inaugural races. Now we head upstream once again to the infamous Six Mile Falls. Let's cut to the chase: people want to know how things are looking and what approaches (lines) to think about. Here goes. 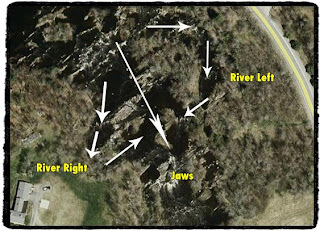 This sat map isn't the best for this example because the water levels were at summer low when the big bird snapped the photo, but generally there are three main approaches taken by most paddlers when lining up for Six Mile Falls. You might want to enlarge this image for a better look. Portage here is optional, not mandatory. Here's a map. Based on our observations, going the river left "loop" is definitely passable at the moment, but it might not be so easy on Saturday. We'll see. As the stream level drops that left hand loop will become bony. On the other hand, this can be a VERY nice route to take to move you out into a position ahead of the falls so that you can line up nicely and cruise on through. Scout the left side loop on Friday night if you can. (See note about MaCKRO clinic below). Click the image above to enlarge. See the island of red willows in the middle of the stream (left hand side of the photo)? 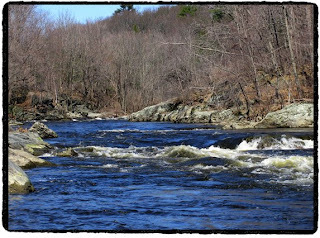 It seems to us that whether you take the river right loop or the "bony left" loop, you'll want to sidle up to this island if possible and line yourself up for the center of the falls from there. Easier said than done, but the current isn't as ridiculous as it has been in recent years (2007 being one of the worst in recent memory). Six-mile Falls gets difficult if the water is too low--sharp ledges all over the place, particularly in the section at the top of the falls. If we're going to run the falls (meaning the water is not too high or too low), we always begin on river left and work our way down through the little islands over there--then move out to run the main chute at the bottom. 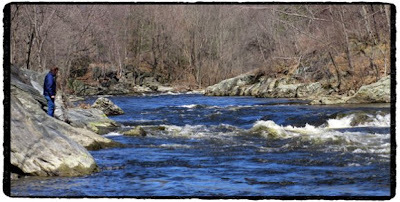 There are several options up top on river left, the best being dependent on the water level. It'll be fun to look at it on Friday afternoon. If you have any thoughts on Six Mile Falls this year, by all means share them with us in the comments! Would love to hear from you. 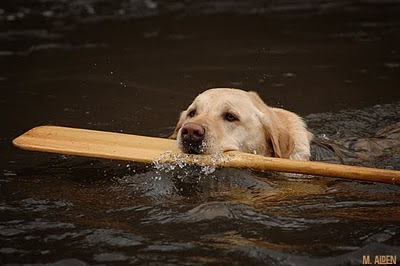 And keep this in mind: There will be a paddling clinic hosted by MaCKRO (below Six Mile Falls) for anyone who is interested in testing and "previewing" the stream on Friday afternoon. Here are the details. 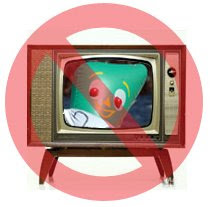 My blog is going into hibernation until March, 2009. In the meantime, I invite you to read through all of the archived blog entries and associated comments. 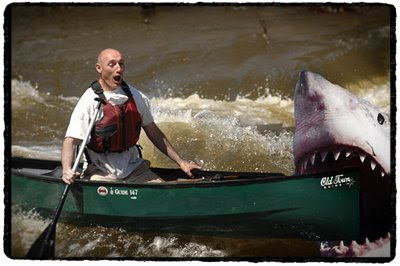 And please share (via comments) your favorite canoe race experiences, memories, anecdotes or observations whether you paddled the Kenduskeag or were a vulture. From any year. I'll check in from time to time and I will compile your stories for posterity in the Kenduskeag website for next year. Later days, amigos! Keep your paddle in the water. Bangor Parks & Recreation released the race results for the 2008 Kenduskeag today. Kenduskeag Race Results (2008) - this is a PDF document. And I'd be remiss in my blogging duties if I failed to mention John Holyoke's post race article. Group Paddle Today, And You're Invited! The general public is invited to participate in a hands-on "preview" of the whitewater sections of the Kenduskeag Stream today! 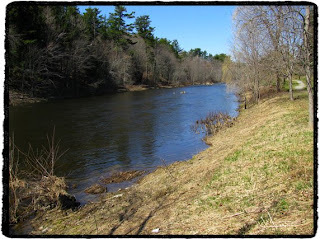 Meet up near the area where the Kenduskeag Stream enters the Penobscot River (near the Sea Dog) at 4pm. You and your boat will be shuttled to Six Mile Falls, and you can paddle your way back to town under the guidance and tutelage of experienced paddlers who will go at your pace and skill level. Bring a dry change of clothes for when you get back to town! 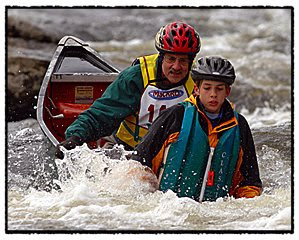 This event is hosted by MaCKRO, the Maine Canoe & Kayak Racing Organization. PS - on race day (Saturday) a special open house event will take place at the Sea Dog restaurant following the race, at 3pm. There will be snacks and live entertainment provided for anyone who wishes to attend after the race. And if you'd like to join MaCKRO, a special introductory rate of just five bucks will get you there. 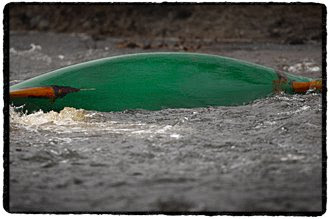 Celebrating 110 years in the business, Old Town Canoe has offered to award a canoe to the fastest overall craft in this year's Kenduskeag, as well as an Old Town canoe to the fastest Old Town canoe, and an Old Town kayak to the fastest Old Town kayak in the race. Sweet! 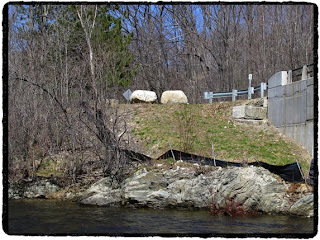 WABI-TV5 Bangor (CBS affiliate) will be broadcasting the race from the bridge at Six Mile Falls this year, and there will be a live internet stream available at www.watchmainesports.com for $9.95. To get you stoked, there's a video clip of an Old Town Canoe advertisement combined with a short WABI-TV race promo here. I created a timeline of the Kenduskeag Stream Canoe race using Bee Doc's Timeline (for Mac OSX), a software application which allows you to create gorgeous, professional looking timelines for various purposes. Here is the link to my Kenduskeag Timeline. PS -the software developer of Bee Doc's Timeline, Adam Behringer, did a writeup of this on his blog.